Timothy Eaton owes my late father twenty-two cents. Rereading the previous sentence, I realize I should qualify my statement. Technically, the founder of the T. Eaton Co. Limited doesn’t owe Dad anything, as the entrepreneur died in 1907 and my father wasn’t born until 1915. Instead, the now-defunct department store Eaton founded is in debt to Dad. Please allow me to explain how this scenario unfolded. After Dad died, my siblings and I went through his personal effects, among which were two refund checks from Eaton’s. Refund check No. 46021 is in the amount of two cents. 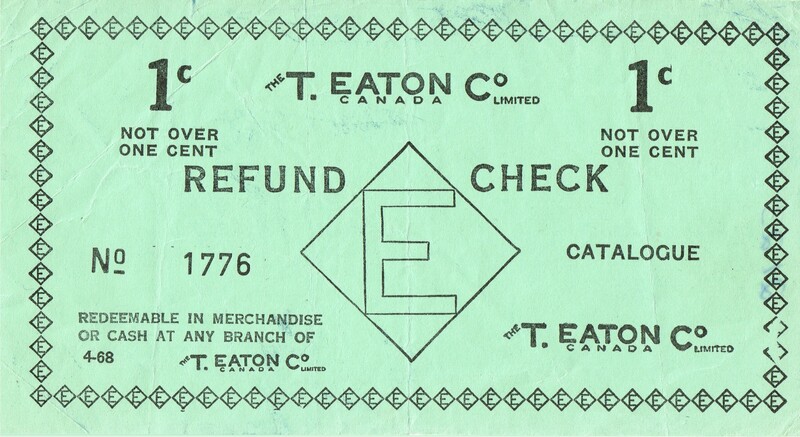 According to a notice on the slip of yellow paper, “this check will be accepted as money on a future purchase.” The amount was payable on demand to the bearer in cash or merchandise at the Eaton’s office in Moncton, NB. Refund check No. 49844 is for twenty cents. Two cents plus twenty cents equal twenty-two cents, the amount Eaton’s owes my father. Which reminded me, of course, of the two refund checks from Eaton’s which my father had in his safe deposit box. I wish now I had asked him about the circumstances surrounding these checks. What did he order? Where was he living at the time? Why did he overpay? When did he receive the refund checks? Why did he hold on to them? Why didn’t he redeem them? What would twenty-two cents have meant to him? Twenty-two cents may be a negligible amount of money today, but perhaps it would have been welcome in the days when, as Dad often put it, Newfoundlanders on the dole, or able-bodied relief, received six cents a day.